A group of people become trapped in a hospital by a gathering of hooded cultists and discover that the hospital has been taken over by grotesque creatures with a sinister agenda. Though Steven Kostanski and Jeremy Gillespie’s writing/directing offering takes reminiscent cues from The Thing, Halloween and Hellraiser to name a few it has enough kicks and story beats to stand on its own two tentacles. With a page of H.P. Lovecraft’s Cthulhu The Void befits from convincing practical effects, old school film making and filmatic aesthetics which harks back to the high-end days of horror. After a shooting a woman is mysteriously set ablaze, Deputy Daniel Carter picks up an injured man in the road and akin to Halloween 2 and Assault on Precinct 13 a group hold up in a remote hospital after encountering creepy, white sheet covered figures offering Wicker Man and The Fog chills. There we become acquainted with the players and things go pear shaped with killings, mistrust shenanigans and gross out mutations. Kostanski and Gillespie effectively couple this with sporadic modernised Fulci visuals (City of the Living Dead) thrown in for good measure, it has its surreal moments. Yes, it oozes John Carpenter in the first half and Clive Barker with a bit of Polanski in the second but that’s not a bad thing, it’s one of the films strengths as it plays as a homage of sorts. The acting is first rate, with the edge of De Niro Aaron Poole (Forsaken, The Last Will and Testament of Rosalind Leigh) as Carter simply shines as the out of his depth officer is thrown into a maze of blood and gore with its darkened corridors and basements. Although Kathleen Munroe’s (Survival of the Dead) screen time is limited, she puts in a solid performance as Allison. Notable is Stellan Skarsgård looking Daniel Fathers as the hot head parent who wants to destroy the mysterious cult, pealed skin antagonist and his monsters. Kenneth Welsh (also of Survival of the dead fame) knocks it out of the park as Dr. Richard Powell. Like the supporting actors including Ellen Wong and James Millington, both Munroe and Poole set up a good emotional character rapport and you buy into their plight. With some twists and as the story takes place over one night it gives it an intense ride feel with a score that adds to the on screen tension. Kostanski and Gillespie give The Void enough symbolism as to not spoon feed the viewer and top it off with some surrealism. It’s not some sub-par cheap looking digital addition to the genre, they offer serious suspense with excellent staging and full on displayed visceral practical effects as the characters try to survive the night from the weird shrouded cult and icky biological monsters. 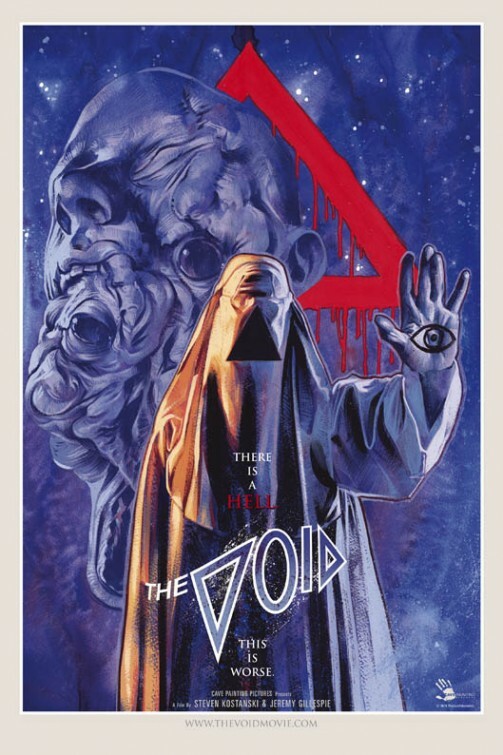 Overall it’s a must see sci-fi horror hybrid, The Void is for old school effect house horror fans as well as new comers.